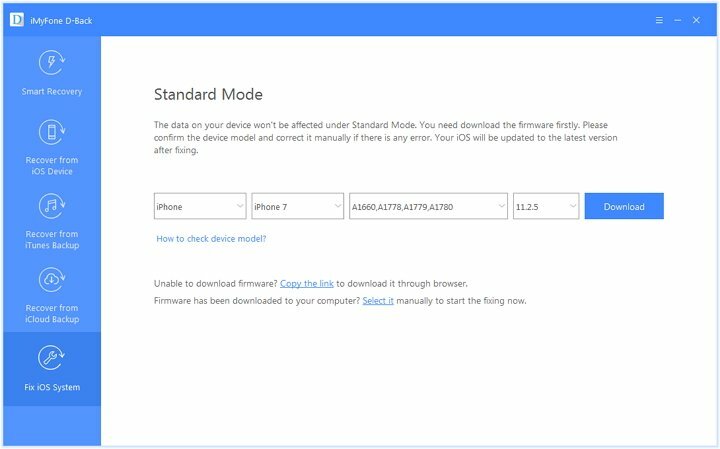 Apple recently released its new iOS (11.3) firmware. This is really a good news since many iOS users are expecting the new version to resolve the problems they've got using the previous iOS versions. No doubt, most of the users must be excited to run the iOS 11.3 on their iPhone. Although iTunes seems to be a good way to update iPhone, many people might meet some problems when trying to install iOS 11.3 using iTunes. If you're one of those, you are at the right place and we will tell you 2 ways so that you can update your iPhone to iOS 11.3 without iTunes. 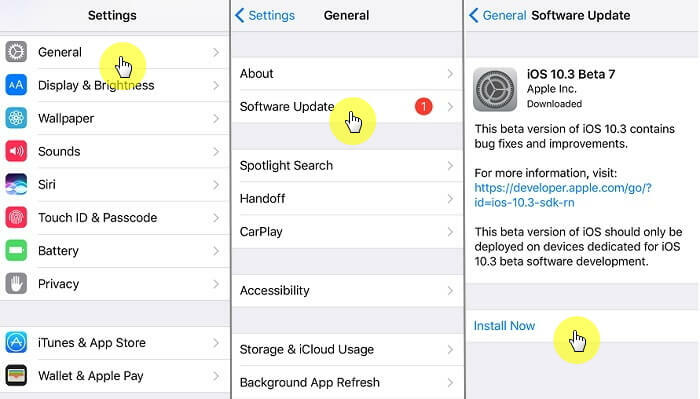 Here is the first way to update iOS without iTunes. It is updating over the air. For this method, make sure you have an active internet connection if you want a smooth and error-free updating process. In addition, make sure that you have enough storage that allows you to install the new iOS. The process will complete in a fast way if you're having a stable and fast internet. It takes 10-15 minutes (usually no more than half an hour) to get the updating done. Here are the steps to install iOS 11.3 over the air. Firstly, take your iOS device and open 'Settings'. Tap on 'General' and go to 'Software Update'. When the update is available, just tap on 'Download and Install'. If the software has been downloaded, just click "Install Now". Enter the passcode now and agree to the terms and conditions. Now the downloading will begin and you need to install it when prompt. If you meet a problem when updating to iOS 11.3 over the air, you should try a professional third-party tool without using iTunes. In such case, all you need is iMyFone D-Back. It is basically a data recovery tool that helps you recover more than 20 types of data on your iPhone and also allows you to export these data from your iPhone or iCloud/iTuns backup. Besides, it is also an iOS recovery tool which will positively help you in updating iPhone to iOS 11.3 without iTunes. If you get an iOS issue like iPhone stuck on recovery mode/Apple logo/white screen/black screen, keep restarting or freezing, you can turn to this tool (using the feature Fix iOS System) for help as well. The data will not be influenced under the Standard mode. Also, being able to work with Windows and Mac computers, the tool is the most recommended by the users and other popular media sites such as Macworld and Makeuseof. Let us have a glance on how to use the tool in order to install iOS 11.3 without iTunes. Download and open iMyFone D-Back in your PC. Once done, click on 'Fix iOS System' followed by making a connection between your device and PC through USB cable. The next step is to put your iPhone in DFU or Recovery mode by following the instructions displaying on the screen. 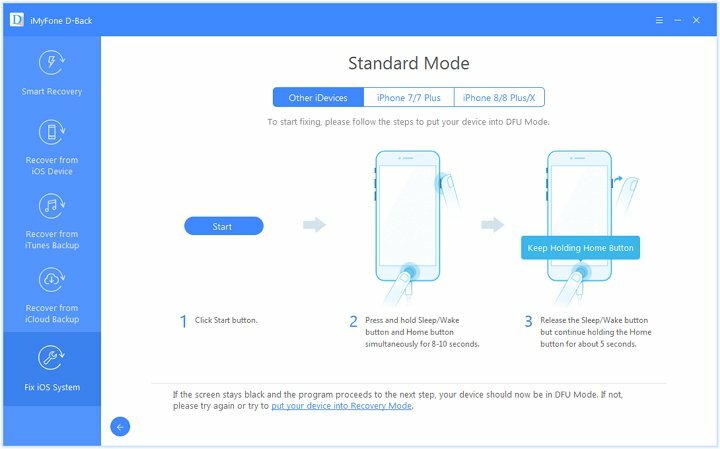 As soon as you put your device into DFU mode, it will be detected by the program without difficulty. Now, it's time to update iPhone to iOS 11.3. Just click on 'Download' button and leave the rest on the program. Once the firmware is downloaded, click on 'Start to Fix'. The process will finish soon and your iPhone will be running iOS 11.3 now. It shows Fixing System Now on the screen since it is basically an iOS repair tool, and it will not influence the installation of iOS 11.3. Now that you have mastered how to update iPhone to iOS 11.3 without iTunes, we would like to advise you to take back up of your device, as a precautionary step, before going to update it. 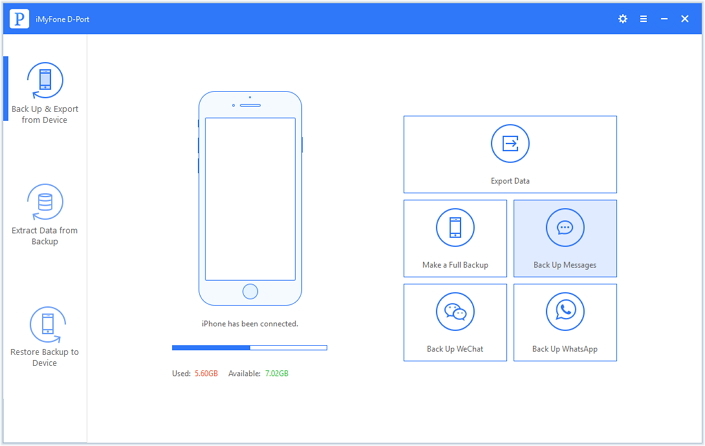 You can try iMyFone D-Port which is also developed by iMyFone team, a powerful tool that effortlessly makes backup of your data either selectively or completely depending upon your needs. You can also export 19 types of data from your iPhone and iTunes/iCloud backup. 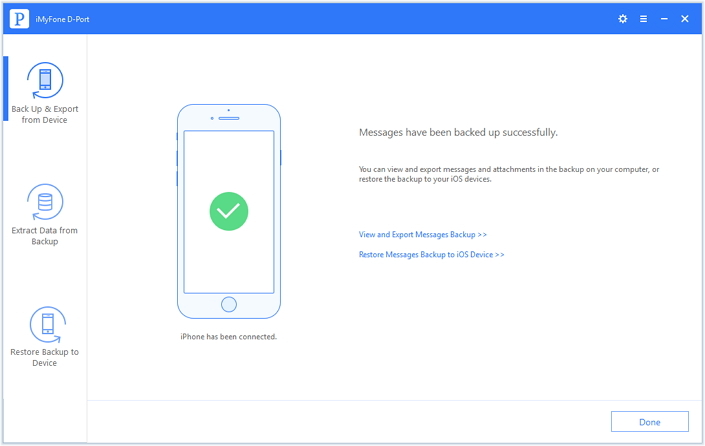 Since the tool supports WhatsApp, WeChat or messages for selective backup currently, we are going to take messages as example here. You can follow the same process for other files. Also, the tool is promising to support more data types in future with its new version. Open the tool after installing it and connect the device to PC. 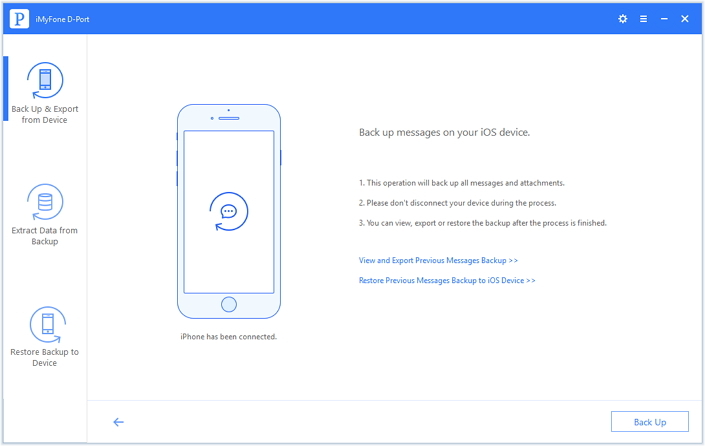 Click on 'Back Up & Export from Device' followed by 'Back Up Messages'. Now, click on 'Back Up' and ensure to maintain the connection between the device and PC until the process gets finished. At the end, you will get notified that your data has been backed up successfully.